Eliminate the need to hide or carry house keys and never worry about losing or forgetting them with this Schlage Plymouth Satin Chrome Elan Keypad Lever. The electronic keypad can be programmed for up to 19 user codes. The lever is also conveniently reversible for easy installation. Learn how to remove a door knob or lever here. Learn more about the different types of smart locks here. 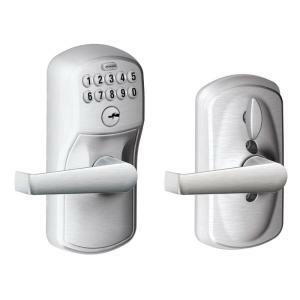 Tbook.com crawls the web to find the best prices and availability on Locks and related Tools and Hardware products like Schlage Elan Satin Chrome Keypad Electronic Door Lever with Plymouth Trim Featuring Flex Lock. For this page, related items include products we find that match the following keywords: "Lock" at our vendor partner Home Depot. Schlage Elan Satin Chrome Keypad Electronic Door Lever with Plymouth Trim Featuring Flex Lock is one of 147 Locks and related products listed in the Tools and Hardware section of Tbook.com If you have any questions on this product, please give us a call at 734-971-1210 during the hours of 9am - 5pm EST for assistance. Thank you for shopping at Tbook.com, the Internet Department Store!